I've been wrestling with this concept for quite some time - I grew up on fantasy novels, and was more than a little dissapointed when someone (whom exactly I don't recall) dutifully informed me that there never was any such thing as a double headed battle axe. I then dutifully informed several other poor ignorant souls of this important fact in a rather condescending fashion. I even snickered at my lovely wife (under my breath of course) when she told me she really liked the Hanwei Heros Axe, and told her if I was going to buy an axe, it would have to be "historically accurate". Someone brought up the Labrys, but they were ceremonial as far as I have read. Then I found this little article, and it's fairly convincing (IMO). Now don't I feel foolish. This is the first evidence Ive seen, but its pretty clear that to some extent, double axes did exist and were in military use in western Europe. Why haven't I come across this before? are there any surviving examples? Should I start sending letters of retraction to all of my fantasy loving friends? I really dislike "fantasy" weapons and prefer more austere pieces, so I had passed over some good deals on this type of axe. Now I wonder about the headweight and speed of such a weapon. Axes tend to be pretty darn head heavy by design, wouldn't the extra weight make the axe a bit slow for combat? And I cant imagine trying to stay up on a horse and swing that much weight at arms length, I think you'd throw your back out! The article suggests they were largly used for cavalry, it just dosnt sound practical. Are there any "quality" manufacturers of a winged axe? In other words an Arms and Armor as opposed to Bud K. I KNOW they've got fantasy axes out the wazoo. Not a labrys per se, but an anglo saxon medieval axe. If not, why not? Not popular with the historical crowd? Too "fantasy"? I'd really like to see some surviving examples, if anyone had pics. In any event, I've learned my lesson about being a snob when it comes to history. You cant know everything , so dont act like you do. Arms and Armor used to make a tabar, which is to say a double headed battle axe from India. They discontinued it a while back. I guess it didn't sell well. It was all steel, and I think around 33 inches in length. I may be wrong, but that number seems to jump out at me. "The truth shall make ye fret." A number of years ago it did become somewhat of a trend to dismiss double bladed axes as pure fantasy. However there are plenty of examples of them stretching a pretty broad time range if I recall correctly, but most do seem to be the tool variety rather than designed as a weapon. 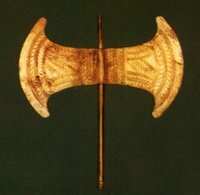 A few years ago I looked into them a bit and remembered finding documentation on double bladed axe pendants, seems like it was more ancient in time period and either in the mediterranean or eastern european areas. A quick search just turned up the "Battle axe" culture, although those are copper. Might also look up more on labrys, as that might be more of what the pendants I found referenced were. That practice stems from the symbolic labrys, and has been affected by several, ummm, rather unusual groups. Not sure how to phrase that and dont want to get into the modern aspects of it, suffice to say there may be considerable historical significance of the term "Old Battlaxe". Right. Do a search for labrys, you'll get the idea. Again, I'm more interested in a modern reproduction of the European weapon, not so much the middle or far eastern types. The're cool too, but I'm really focusing on the anglo saxon aspect. One advantage I see is that a double headed symmetrical design if held horizontally is neutrally balanced and no effort is wasted trying to keep a heavy single head from rotating in your hands when wielded in a horizontal chop. A poleaxe with a hammer on one side and an axe head on the other is balanced in the same way. In any case this is my theory not based on any historical research but arrived to after handling, casually, a heavy Danish axe and my A & A poleaxe. Oh, the small size of those axes you mention may be because they are also intended as throwing axes and two edges increase the odds of something sharp hitting a target. One thing we can say for sure about history: Most of it is lost to us forever and what we believe is the truth depends on surviving documents and artifacts. Multiple sources confirming the same things are more credible than sole surviving sources, and logic and reasoning can fill in some blanks. I guess there is a spectrum of certainty about historical " facts "
That's why I'm curious if anyone has ever tries it on a horse. A good halberd is a joy to use, as is a good skeggox, but again that's on foot, where one can get a good stance, but on a horse, with the shorthafted axes pictured, I'm trying to imagine twisting reaching and striking at a man on foot, it just sounds unwieldy. But then I dont get along with horses, and cant claim to understand fighting from horseback anyhow. Pictorial evidence is generaly the hardest kind of of source to used, it is hard to determine what is based on a real object the artist has seen and what is "artistic licence" unless a picture can be supported by documentary and archeological sources as well. One well know drawing of an event at the battle of Bouvines 1214 show a mailed mounted archer armed with a composite bow. Does this mean that the victorious French army employed mounted archery? 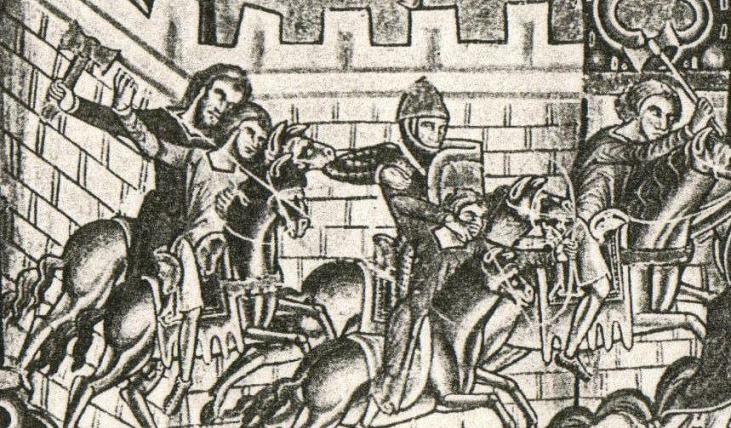 The kingsmirror (1250) mentions the use of "Horn bows" and weak crosbows from horseback, but does not go into detail. A bit of a digression, but I found the Varangian guard picture very interesting (second 'here' in the link). Is that a top spike on their axes, or simply the shaft extending well beyond the head? All the double Islamic tabars I have seen are 19th century, earlier tabars invariably are "single-headed" AFAIK. 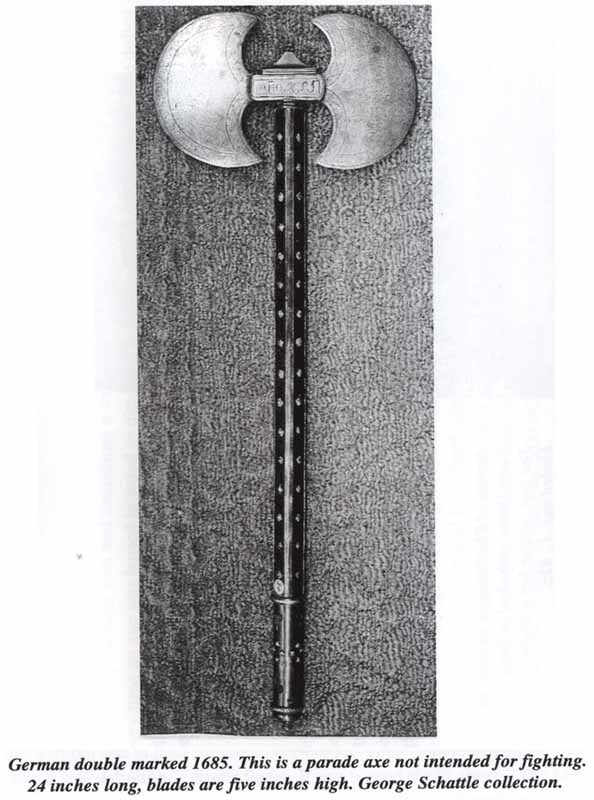 I think the 19th century double-headed tabars are ceremonial or parade weapons and were never meant for combat use. Anyhow here's attempt #2 at posting the pics from the artcicle. I've also included a pic of a labrys, which as I said, tended to be ceremonial. Looks pretty useless to me, one whack and the haft would bend. Maybe that's the itea, flip it around and whack it back into shape. I don't know how historical it is, but there is this: http://www.todsstuff.co.uk/html/woodsmansaxe.php Looks a lot more sturdy than the ceremonial ones, eh? Now that's more like it - sturdy and practical. But is it too thick to be quick? Is an axe with enough distal taper, designed to cleave flesh and mail really sturdy enough to be used for other tasks? And why do the men in the above pic appear to be armorless? Is that a stylistic interpretation? I would assume anyone wealthy enough to own a horse would also own some good armor? Or are these just yeomen on horses with woodsmens axes? I have that axe. It's the Gränsfors bruks double bitted felling axe. Todd doesn't make them he retails them. It's a very cool item with lots of character. It's handforged and came hair shaving sharp. Beacuse the axe is left black and rough from the forge it has an old world feel to it. GB also sells a throwing axe with the same head and a shorter shaft. The axe is meant for felling trees with so it wants to be swung hard without tought of a quick recovery. In the swing it's well balanced though and the razor sharp edge would be lethal even in a weak swing. There seems to be a common theme running here. Nearly all the double head axes shown here, whether they are Indian, Iranian, European or even Ancient Minoan are ceremonial or parade weapons. The only functional ones are for felling trees, not people! Well, when you think about it, practically everything imaginable has probably been used as a weapon sometime. I think there's an aikijujutsu kata involving bashing an attacker in the nuts with a rice cooker lid. Somewhere, someone busted out their double-bladed axe and cracked some heads with it. However, that doesn't make it historically representative, only vaguely historically possible in the sense of, say, somebody getting killed because they were running under the trebuchet during a sally and the siege engineer decided to trigger the thing.